Every mother is special. They’re the reason the world goes round as they have birthed great men and mighty women for centuries. There are hundreds of thousands of mothers across this planet that should be highlighted for Mother’s Day. Today, we salute Gwen Green. A native of Oakland California, Green grew up in a household of game changers. Born the only child to Rose and Edward Smith, Green also had the benefit of growing up with her grandparents, Mr. and Mrs. Robert Lee Williams. At the age of five, Green remembers her grandfather getting involved addressing racism in the Oakland District Attorney’s office. The District Attorney at the time didn’t want a black secretary working for him. Her grandfather was Pullman porter who would eventually start up a training program, as there weren’t any at the time. He went on to become involved in issues surrounding his profession and organizing within the system. Green’s grandfather and mother were also active in the NAACP, seeds that would undoubtedly grow within Green’s lifetime. “My mother helped integrate the swimming pools in Richmond, California,” said Green. “They were very, very active.” Green attributes these early experiences to who she would become and what she would do with her life. After she married Arthur Green at the age of 18, her journey began changing the world around her, one step at a time. Her husband Arthur, who was studying law, was the second Black to attend the University of Colorado. Green would encounter racism with the same zeal and fortitude as her parent and grandparents. Barbershops in Boulder, Colorado at the time refuse to cut her husband’s hair. 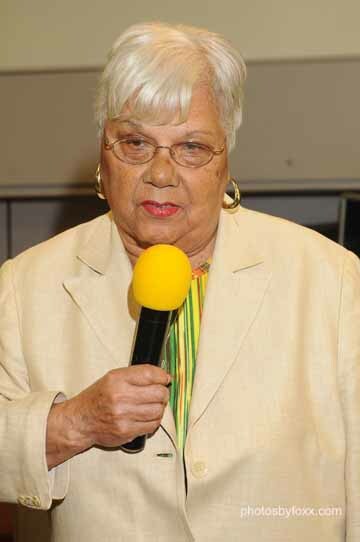 Green would devote 65 years of her life to being a civil rights activist. In the 1950’s, she has worked at various NAACP offices including San Francisco, Oakland and San Diego before moving to Los Angeles. In San Diego, Green became active in getting the women involved in positive activities in the community. Eventually moving to Los Angeles in the late 1950’s, her husband, working for Golden State Insurance, Green would show no signs of slowing down. She would work with numerous campaigns and grass roots efforts including working with Dr. Martin Luther King, Jr. She worked with King’s field director, Hosea Williams, as assistant director for the Summer Voting Drive in 1965. She travelled through six southern states and through 120 counties providing voter registration, helping people to a voice in this country. Green would work with educators, dignitaries, actors and ordinary folks. She has worked with political giants such as Tom Bradley, Los Angeles’ first Black Mayor, Julian Dixon, Yvonne Burke, Alan Cranston, John Tunney, Herb Wesson, Mark Ridley-Thomas, Edmund G. “Pat” Brown and former LAUSD James Jones just to name a few. She’s also recognized for having served as a consultant of the United Long Term Care Workers Union for 20 years. Green was a warrior for the union and in the late 1980’s, made it her mission to insure fairness for workers. She was instrumental in the campaign to get then Santa Barbara Ave. changed to MLK Blvd. Green is one of the founder of the New Frontier Democratic Club, one of the largest African American political clubs on the West Coast. Green would become a mother of two daughters: her eldest daughter, Claudia who passed away two years ago and Robin. She has a host of grandchildren herself who she, undoubtedly, has passed her legacy of change to. Green spoke about the importance of family and being a mother, pointing out where families today may be going wrong. She also commented on her job as mother being twofold as her husband was also a part of the equation. “I had a husband that was willing to work together and we were involved,” said Green. Green has left an indelible mark on the world and her family no doubt. She must have if everybody calls her “mama.” You don’t get that title unless you’ve been one towards many and clearly she has been.